Postpartum Training | Move fast. Think slow. You’re still breastfeeding?! I get this question a lot. Zoe breastfed until just before two years old, and Nico is still going strong and feeds on-demand at 15 months. Whenever he pleases, the “dairy queen” is always open, ha! I don’t proclaim to be a “lactivist” and I certainly can appreciate the difficulties my friends and many women have with breastfeeding be it milk production, ongoing latching difficulties, scheduling with returning to work, or any other obstacles that make continued breastfeeding more stressful than pleasurable for mommy or baby or both! I have one athletic friend, who said, “My body didn’t feel completely normal again until I stopped breastfeeding.” I can’t say I’ve experienced the same. And other than the 9 months plus I was pregnant with Nico, I’ve spent 3 out of the past 4 years breastfeeding while training and competing. In fact, I’ve even found it even has the ability to enhance performance and here are my top reasons why…. 1. Motivation to set personal bests. In the first six months you may set some personal training and racing bests because you’ll be worried your infant will starve if you don’t get back to them in time! 2. Extra rest and recovery time. You can sneak in some extra and valuable downtime while breastfeeding, with a great excuse to put your feet up for 10 minutes or more, ahhhh…..You can say “Sorry ‘husband’, I can’t help with dinner (or whatever else) right now, ‘baby’ is nursing”….”Sorry, ‘other child(ren)’, can’t play etc right now, ‘baby’ is nursing.” Its also an easy way to calm your child and help them get to sleep easier! Plus the hormones oxytocin and prolactin are released which make mommy feel more relaxed! 3. You can eat for two! I know many jokingly say this while pregnant, but I’ve found “eating for two” is truly more appropriate while breastfeeding and exercising, especially during the second year of breastfeeding! Breastfeeding moms can burn an extra 300-500 calories a day. I’ve never been as lean as I have while breastfeeding. And I do not really have to watch what I eat! As long as I’m breastfeeding while training regularly maintaining race weight hasn’t been a problem, particularly in year two, perhaps due to the increased fat content of the milk as explained by the following quote found on http://www.kellymom.com…. 4. You may continue to increase your pain tolerance. As most mom’s experience, once baby turns into a teething toddler, these little nursing munchkins like to practice their acrobatic moves, “twiddling” the side they are not feeding from, and occasionally chomping down with their teeth! Yeowww! 5. It enhances baby’s performance! You can be motivated by the fact that a few months or years of your life spent breastfeeding can go a long way for baby. Research has shown breastfeeding children benefit nutritionally, are sick less often, have fewer allergies, and are well-adjusted socially. Extensive research has also linked duration of breastfeeding to cognitive achievement! 6. It enhances mother’s health factors. Mom’s who breastfeed past infancy reduce the risk of breast, ovarian, uterine, and endometrial cancers. Breastfeeding also protects against osteoporosis, reduces the risk of rheumatoid arthritis, and can help moms lose weight easier (as already mentioned). I also enjoyed a similar post by Brandi earlier this year, as her son’s “boobie time” came to a close. Click here to read. What do getting back in shape after baby and LTAD stages have in common? 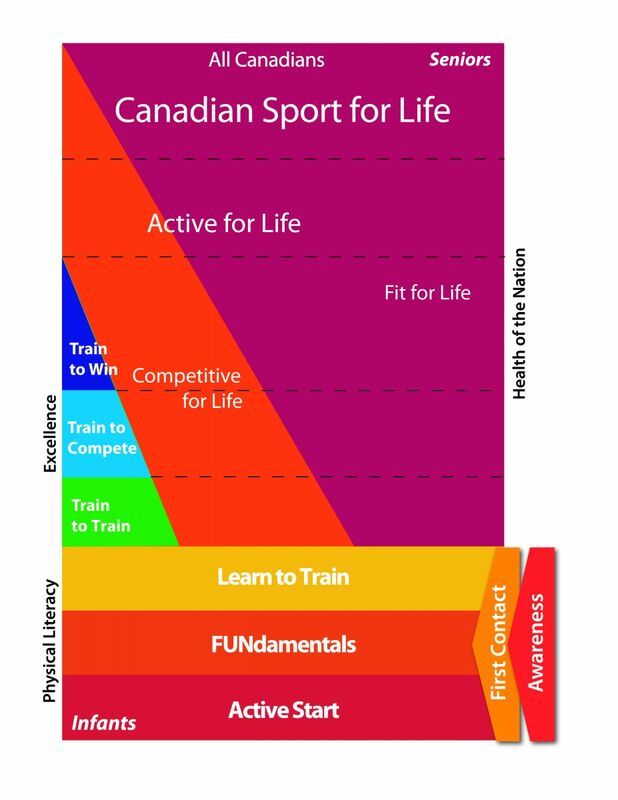 The Long-Term Athlete Development (LTAD) stages were created by Canadian Sport for Life as a guide, to quote the website, for “an individual’s experience in sport and physical activity from infancy through all phases of adulthood”. Getting your body back in shape after having a baby can feel like you are starting at square one again, and literally like taking baby steps all over again as far as fitness is concerned! As with exercising during pregnancy (the subject of future posts) I’ve been asked quite often about getting back in shape after childbirth. When I think back to my fitness progression in the year after giving birth I can relate it well to the seven LTAD stages, which are below with a Postpartum spin and a rough timeline for each. Of course, the timeline is very approximate and very individual depending on the birth experience, the baby and number of older children you have, your pregnancy training, and how determined you are to get to or back to a certain fitness level! 1 – 2: Active Start and FUNdamentals (0-3 months postpartum): This is the go with the flow stage. You are adjusting to life with a newborn and really going by feel. Any physical activity is short and for fun such as social walks with baby, yoga, some core work when you feel ready, a light spin on the bike, with no structured training, just something as often as you can that makes you feel good and gives you a little time to yourself! 3. Learning to Train Again (3-6 months postpartum) : If all goes well, at this stage a slightly more structured approach can be taken. You may start making weekly training goals, make a training schedule, or sign up for a regular class. With the ligaments that were loosened during childbirth getting tight again impact exercise such as running can start to feel more comfortable, especially if doing any intervals or speed work. 4. Training to Train (6-9 months postpartum): After both of my children it wasn’t until about the 6 month mark that I felt more normal again, and feeling strong and “normal” in my core again, especially while running. So at this stage I felt good to go as far as following a regular training program again. If competing at all, races can be a good gauge of progress but may be viewed more as “training races” in this time frame depending on your goals. Many moms can get frustrated if they haven’t lost the baby weight by this point but I would emphasize here the importance of focusing on how much better and stronger you feel after exercising consistently again. Weight loss may plateau at times but as long as you are feeling fitter and fitter and make the time to workout consistently while eating healthy the weight will take care of itself eventually! 5. Training to Compete (9-12 months postpartum): Now it is go time! Depending on your progress, you may be able to drop the “I just had a baby” excuse for performance. By this stage after both of my children I was back to my pre-pregnancy weight or lower (thanks to breastfeeding!) and previous benchmarks as far as interval times in training and tests on the bike. If you’ve worked hard you can feel as fit as ever and ready to tackle any training or race challenges you’d like to set for yourself around the 12 month postpartum mark! 6. Training to Win (12 months postpartum +): While obviously not every mom’s goal is to go out and win races after having children, I look at interpreting the Training to Win phase as the time during which you can set more challenging goals for fitness or competition, whatever that may be personally for you! Raise your personal bar a little! For me, that began with training and competing at the same level I was prior to children, and then working on improving that level over time – before my advancing age starts to slow me down that is, ha! 7. Active for Life: Congratulations! If you’ve made it this far, have managed to stay fit during pregnancy and after a child or two, you’ve made it through one of the biggest obstacles in life to staying fit and will have no problem making physical activity a priority for in the coming years! Returning to racing easier after baby number two?! 1. I won the baby sleep lottery! My firstborn, Zoe, often woke up and liked to play for an hour of more a few times per night until at least 3-4 months old and regularly woke up in the hour of 6:00am well past the age of one. On the otherhand, by about 10 days old, Nico was sleeping through the night other than waking up to nurse and go right back to sleep which he still does. He also has rarely woken up for the day before 7:30am so I have been able to wake up most days feeling reasonably rested and ready to go! 2. I was committed to get back in shape fast! While pregnant with Zoe I was unsure of whether I would feel like racing again after she was born. I signed with my current team, the LUNA Pro team, a month or so after she was born, and that motivated me to get going. While pregnant with Nico I had already signed a contract with LUNA to race the second half of the season starting in August after he was born in May! But you don’t have to be on professional team to set some comeback goals to get yourself going. I’ve talked to several moms who’ve told me they set goals while pregnant to for example, to run at 10k at 4 months PP, run a marathon at 6 months PP, or complete an Ironman at 12 months PP etc. 3. I’ve been there, done that! Having your first baby is a major live changing event! It is exciting and overwhelming at the same time with so much to learn about yourself and taking care of a baby. Like anything new we try in life, once we’ve been through something once, we’re much better prepared the second time- for example, in sport I often think of an athlete returning to his or her second Olympics way better prepared about what to expect because they’ve been through the crazy excitement of it all once already. With Nico I’ve been more relaxed, and have been able to get in much more “guilt-free training” knowing he is well taken care of – it has also helped that Nico also took a bottle since 4 weeks old and Zoe never did. Having already traveled to countless races with Zoe, the extra organization of having two versus one to travel with has been less of a jump. Who knows, maybe it would be even easier again after three kids. Since I don’t plan on finding out, maybe some other moms would know?? HA!